An initiative by BCM Institute and accredited as a competency-based training course by SkillsFuture Singapore (SSG). The “Developing a BCM Training and Learning Roadmap” is a 1-day course aimed at equipping designated Business Continuity Management (BCM) manager together with their human resource counterparts to develop and implement a training roadmap for business continuity, disaster recovery, BCM audit and crisis management personnel. The course is targeted specifically at management with BCM responsibilities, designated organisational BCM managers, business unit BCM coordinators, human resource manager and anyone responsible for the career development and BCM professional’s competency building for their organisation. The course will introduce the essential steps of developing a training roadmap in the event of a crisis, including the types of training awareness programmes and training delivery methods for a crisis, the types of disruptions caused by a crisis, and how to evaluate the effectiveness of a training programme. 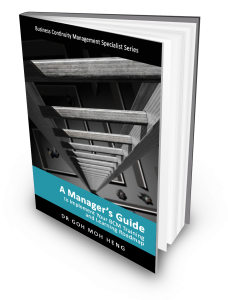 The first 10 confirmed and registered participants will receive a copy of the “A Manager’s Guide to Implement Your BCM Training and Learning Roadmap“. 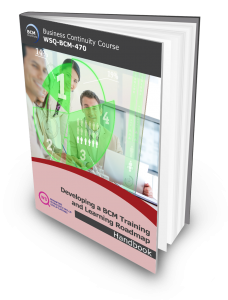 Currently, there is no BCM certification that is attached to the course as this course aims to provide guidance to the Learning and Development or HR team together with the Organisation BCM Coordinator (BCM Manager) on implementing an effective training roadmap. All attendees will receive a Statement of Attainment from SkillFuture Singapore. Determine the necessary crisis response and recovery activities to be executed by the respectively designated personnel within the organisation. Identify types of disruptive activities affecting the organisation and the skill set needed to address the events. Identify the competency gaps of key employees to prepare the training roadmap. Identify types of training delivery methods suitable for the various level of employees. Identify types of training and awareness programmes. Evaluate the effectiveness of training programmes by performance criteria and refine the programme accordingly. Crisis Management and IT Disaster Recovery Managers from all industries. * For more information on funding, please visit www.skillsconnect.gov.sg for eligibility details and WSQ application.